By far, the best family beach -- we go here every year. Pond on one side and ocean on the other over the dunes. Its pricey to get in and can be closed due to limited parking. The walk to the beach is long but fairly easy with mulch and sand. Outdoor showers and Port o Pottys on site. No lifeguards. Our favorite beach is Long Point, a Trustees of the Reservation Beach, a short ride from the home off a private road. Fantastic beach for family. Only thing to note is you need to arrive promptly as it fills up in the am. It is worth getting there early and the long walk! Limited parking so get there by 9:30 am or you won't get in. It's a long ride to the shore so leave enough time. This is Trustees of Reservations beach. The first time we stepped on the beach, it took our breath away. Gorgeous shore line as far as the eye can see. Picturesque setting, big waves, lake access for small children. Highly recommend. 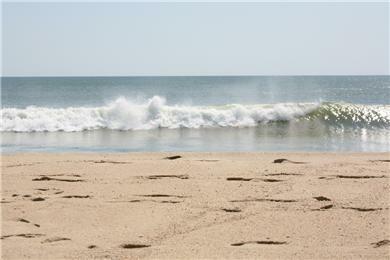 Offering the best of both worlds, a warmer calm pond on one side of the beach, the wavy boogie boarding ocean on the other. Perfect for families with varied beach requirements, satisfying everyone in the same visit. Make sure you go either early or late, as there is a fee and limited space for parking. This home [Property ID 23070] is close to Long Point Beach which has the benefit of the fresh water pond and the ocean side of South Beach without the crowds. Long Point Beach is part of the Trustees, worth a day trip. This was a great location for families with young children because there is a beach, as well as a large pond that allows for calmer swimming. While visiting this summer, we enjoyed witnessing a sea turtle release, compliments of the Wildlife Refuge on site. They do limit the number of cars that can park on site, so check opening times and plan to arrive early! It's a great beach for everyone. Only downside is you must arrive early or you can be shut out of the parking lot. The beach was very different from the hurricane, which made for a steep incline. Overall, we enjoyed the ocean and the pond with our children. Favorite spot on earth. Great for families. Lots of beach so you can spread out and enjoy the beauty. Great for walking. Also have the fresh pond to rinse off. Great combination of surf on one side and calm pond on the other! Great picnic beach. We love to kayak across Great Tisbury Pond to the backside of Long Point Beach and hang out by the cut or walk back toward the Trustees entrance.